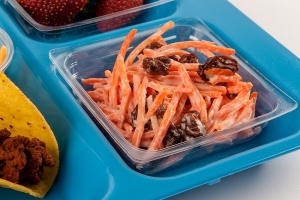 Place shredded carrots and raisins in large bowl. Combine dry milk powder with water and mix to reconstitute. Combine milk, mayonnaise, salt, nutmeg, and lemon juice. Pour dressing over carrots and raisins. Mix lightly until thoroughly combined. Cover and refrigerate for 1 to 1 ½ hours. CCP: Refrigerate at 41 degrees F or lower until ready for service. Portion with #8 scoop per serving, Each portion provides ½ cup of red/orange vegetable and 1/8 cup serving of fruit.